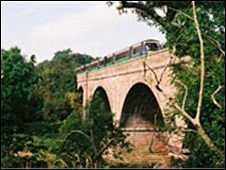 Two MSPs for southern Scotland have clashed over plans to reopen the rail line between Edinburgh and the Borders. The SNP's Christine Grahame has accused Lib Dem Jeremy Purvis of putting the scheme in jeopardy. She said that by seeking the reinstatement of the Glasgow Airport Rail Link (Garl) he could be putting the £295m Borders development at risk. However, Mr Purvis dismissed the claims that support for the Glasgow plan would have any impact on the other route. South of Scotland MSP Ms Grahame said it was clear that any reinstatement of the airport plans would have an effect elsewhere. "Even the dogs in the street know that reinstating Garl would pose a direct threat to the reinstatement of rail to the Scottish Borders," she said. Ms Grahame said that by supporting the Glasgow link Mr Purvis had "really put the project in danger". However, Tweeddale MSP Mr Purvis said one scheme did not have to put an end to the other. "It is absolutely nonsense to say that if the Garl project does go ahead then the Borders railway is in doubt," he said. He said that he could use the same arguments to say any other major transport plan, like a Forth crossing, would put the line to Tweedbank in jeopardy. He added: "I am not as childish as that, we want to see projects across Scotland, including the Borders railway, delivered." The bill to restore a rail link between Edinburgh and the Borders is approved.